I have traveled all over the United States and have visited many countries throughout the world. When I first started traveling, I was green and made many mistakes with credit cards. Some of these mistakes were financial, and others were, well, a bit stupid. I’ve learned to be smart with my credit cards while traveling and now I’m sharing my tips, knowledge and advice with you. Plan Ahead, Choose the Right Credit Cards to Take With You. Some credit cards are very expensive to use outside of the United States, and foreign transaction fees can be as high as six dollars per transaction. Before leaving on your travels, take the time to find the right MasterCard or Visa card. You need a credit card that doesn’t charge foreign transaction fees when outside of the country. Also, try to get a credit card from a non-American bank such as Capital One or HSBC. Unfortunately, Americans are considered easy prey for fraudsters abroad. Using a credit card from Capital One or HSBC doesn’t scream American tourist, unlike Bank of America and U.S Bank credit cards. For ATM cash withdrawals, consider using a Bank of America debit card. Bank of America is the only U.S. bank that is a member of the global ATM alliance. When withdrawing cash from a global ATM alliance members cash machine, you don’t pay any withdrawal fees with Bank of America. Plus, you get the best foreign exchange rates on the day you make the withdrawal. Open a separate Bank of America account for this and make sure this account is not attached to any others you own. Transfer just enough money you think you are going to need to this account as a good little protection policy in case of fraud. Never use your ATM debit card to make purchases while away from home. You don’t have the same fraud protections with a debit card to that of a credit card. Get an American Express Platinum card. I know this flies directly in the face of what I just said, but please hear me out on this one. And yes, the American Express Platinum card does have a high $450 membership fee, and it’s not widely accepted aboard. If your wallet is ever lost or stolen while traveling, most credit card companies will only mail you a replacement card within two weeks to your home address, which may be all right, but it doesn’t help you when stuck overseas without money. American Express, on the other hand, will send a replacement card within 1 to 3 days anywhere in the world to you. I went to San Jose Costa Rica one time. On the way, I used my AMEX card to buy breakfast. Once I arrived at my hotel, my AMEX card was missing; I had lost it. I called American Express, explain to them I’ve just arrived in Costa Rica and lost my card. American Express called my hotel, arranged direct payment for my room, and I was able to check in. Two days later, I received a replacement card at my Costa Rican hotel. As for that high $450 annual membership fee, American Express offers you ways to recuperate this fee if you’re smart enough to do it. AMEX offers reimbursements for Global Entry and TSA-Pre enrollment fees, offers free Delta Air Lines SkyClub lounge access, provides free Priority Pass airport lounge membership, offers airline fee reimbursements up to $200 per year, and offers free Boingo’s global Wi-Fi hotspot access. As you can see, if you travel regularly it’s easy enough to justify the $450 in American Express Platinum card membership. Credit Cards get lost, damaged, and heaven forbids, stolen while traveling. It’s a good idea to have a backup card kept separately from your main cards. I always carry a spare credit card and keep it hidden either in my suitcase or carry-on. It doesn’t have to be a card that meets the traveling credit card requirements outlined above. But, in an emergency, you’ll have a backup card. 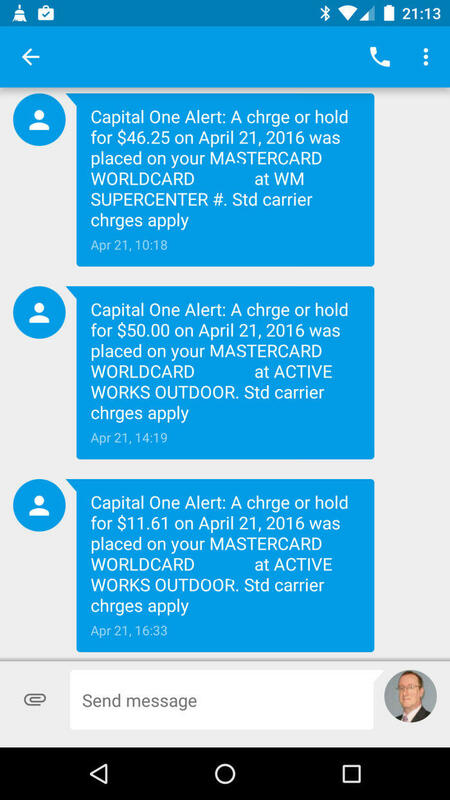 Not well-known, but most credit card companies allow you to set up text alerts to your smartphone. A very useful text alert is the spending or transaction alert. Set this alert up for the lowest amount possible. I have mine set up for any spending over one dollar. When you use your credit card, you automatically receive the text alert almost instantaneously with the merchant name and the amounts charged. It may seem a bit of an annoyance each time you use your credit card and your phone dings, but for me, it has become very useful especially while traveling. This text feature alerted me one time that the hotel I was staying in charged me more than once for my night’s stay. At check-in, the front desk clerk charged my credit card. Later, the night clerk charged my card again. I was able to address this at checkout and have the second charge reversed. If I didn’t have this alert set, I wouldn’t have known about the second charge, and it would’ve been harder for me to dispute. On another occasion while in Canada, I received a text message at seven in the morning saying someone charged one of my credit cards in the States. I called my credit card company, and in this case, it turned out to be a fraudulent charge. I was able to shut the card down before any more fraudulent transactions appeared on the account. Credit card companies also have phone apps which I recommend using as well. These phone apps offer an additional layer of security for your card, and will allow you to switch off your credit card from within the app its self. And this year, these phone apps have started alerting you to each time you use your card. 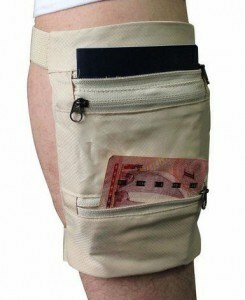 When visiting certain countries or areas with high crime, I use a Leg Pouch Money Belt or Leg Safe. A leg safe goes around your lower leg between your ankle and knee. A potential mugger is unlikely to go for anything in this area of your body. Also, if you are told to drop your pants, the leg safe remains hidden. A leg safe is a good place to keep your travel documents, extra cash, and backup credit cards. Keep written down someplace a list of your credit card numbers with issuing bank phone numbers. This list will prove useful should you lose your credit card and need to call your bank. If you’re traveling internationally, make sure you have the direct phone numbers to your issuing banks and not just the 800 numbers. The United States 800 numbers don’t work in most countries. Make sure this list contains credit card numbers and bank phone numbers only. Protect yourself from fraud and don’t write down expiration dates and CCV numbers. Keep this list someplace where you can find it but don’t keep it with any of your id’s such as your driver’s license or passport. I keep my list in a PDF file in my email account and not physically with me. All I need is my email address and password to access it in the case of an emergency. The majority of fraudulent credit card charges are international. It’s for this reason alone you should notify your issuing bank of your travel plans, especially the smaller banks. Smaller banks have a lower tolerance for fraudulent charges and will switch off your credit card as soon as you make a charge out of the country. It’s important to let all your credit card companies know your travel plans. A lot of banks will allow you to do this online now, so you don’t have to call them. Carry Two Wallets, One For Cash, The Other For Credit Cards. This one I learned the easy way. I was in Puerto Rico one time with a friend. We just arrived at the airport, got our luggage and hired a taxi cab to the hotel. When we arrived at our hotel, my friend paid for the cab ride. He got out his wallet, took out some cash and put his wallet between his legs. He paid the taxi driver, we both got out of the taxi and the cab driver drove off. His wallet never made it back into his pocket! It stayed in the taxi cab. It contained his cash, credit cards, and driver’s license. Not a fun way to start a trip. From this point on, I decided to keep two wallets, one for cash and the other for credit cards. The cash wallet goes into the left pocket, and the credit card wallet goes into my right pocket. Keeping two wallets this way ensures that if I lose one of them I’m not totally down. Make Sure Your Cards Have Chips and Ask Your Bank To Setup a Pin. In October 2015, credit card fraud liability in the United States shifted from the banks to the merchants for magnetic strip transactions. As a result, you are seeing more credit cards today with chips embedded. But here in the U.S., we’re still behind the times compared to the rest of the world concerning credit card security. We have moved to a chip & sign system, the rest of the world is using chip and pin. Before traveling internationally, ask your bank to activate chip and pin on your account. With Chip and Pin, and overseas especially in Europe, you insert your credit card, chip end, into the merchant’s terminal. You enter your pin number to complete the transaction, and no one is any wiser that you just used a foreign credit card. With Chip and sign and the magnetic stripe transactions, the merchants will hand you a pen to sign the sales slip advertising to everyone in line that you are a foreigner, especially the pick-pocketer standing behind you. Do you have any Credit Card tips to share? If so, please leave a comment here and I will respond promptly. Thank you for reading.